This is for the folks at Boing Boing. It’s my iPod!… a nostalgic…um… mash-up of a vintage 1990’s boot box and a bunch of vintage 80’s and 90’s era cassette tapes for playing on my car cassette tape playing device. I hacked the box by removing the boots and wearing them for a number of years. 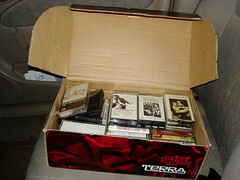 Also, I am screwing the corporate musicstapo because some of these are mixed tapes from pre-blank media surcharge days. Damn I love the taste of freedom! Most times I just listen to my bootPod on random, because I don’t want to take my eyes off the road to see which tape I’m choosing. Andrew Potter take note — both Mellencamp and Springsteen on the “most frequently played” list.